One day you’re a typical student. You’re working part-time at McDonald’s to pay for your clothes and car. The next day, you’re a mother-to-be. You’re confused and scared. Emotional and standoffish. You feel like a kid, but now with a huge responsibility. How could your life change so fast? Your youth wasn’t supposed to be packed with worries and obligations, Lamaze classes and daycare choices—and you’ve still got work and school to deal with. Whatever happened to fun, friendships, and dating? You’d do anything for your baby—but what about you? What about your needs? Sharing stories from her own experience as a teenage mom and from other young mothers, Tricia Goyer shows you what to do about meeting nine basic needs that all young moms have. Needs such as the need to be appreciated, the need to know your life is not at a dead end, and the need to be loved. 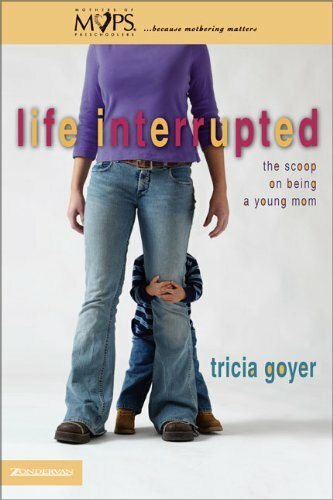 In Life Interrupted, you’ll meet lots of young moms just like you. You’ll also meet God, who cares about you very much.